The Republic of Ireland have been charged by UEFA after tennis balls were thrown onto the pitch during their Euro 2020 qualifier against Georgia. 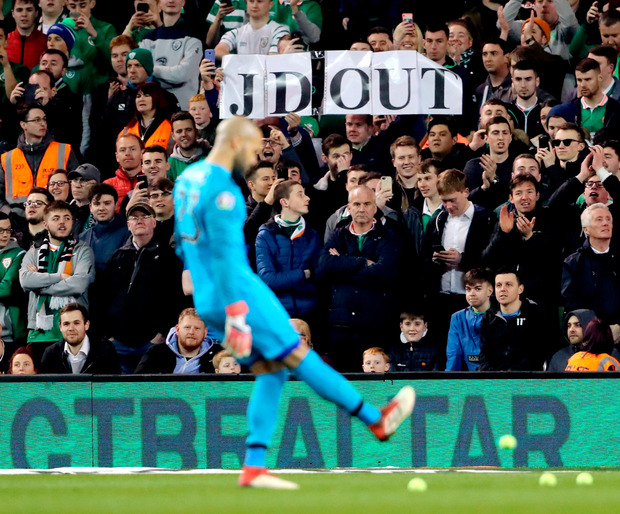 Fans protesting against controversial former Football Association of Ireland chief executive John Delaney took advantage of a break in play during the first half of Tuesday night’s 1-0 win at the Aviva Stadium in Dublin to vent their anger. Returning Ireland manager Mick McCarthy had earlier urged supporters not to risk breaking his team’s concentration by their actions after reports of the planned demonstration emerged, and although that did not appear to happen, Ireland now face disciplinary action from the game’s European governing body. A UEFA statement said: “Disciplinary proceedings have been opened following the European Qualifiers Group D match between Republic of Ireland and Georgia (1-0), played on March 26. “Charges against Republic of Ireland: Throwing of objects – Art. 16 (2) of the UEFA Disciplinary Regulations. The incident happened 33 minutes into the game, an apparent reference to Delaney’s request that the Republic be admitted to the 2010 World Cup finals in South Africa as the 33rd team after they were denied a place by Thierry Henry’s handball in their play-off clash with France. Dutch referee Serdar Gozubuyuk had stopped play to caution Georgia defender Guram Kashia for a foul on striker David McGoldrick when dozens of tennis balls were thrown from the stands. There was an interruption of several minutes while the objects were cleared from the playing surface and when the action resumed, Conor Hourihane curled the resulting free-kick past goalkeeper Giorgi Loria to score the decisive goal. McCarthy was relaxed about the protest after the game with his side sitting top of the group with maximum points from their opening two fixtures, but several players admitted they had not witnessed anything like it before. Delaney’s 14-year reign as chief executive drew to a close on Saturday evening when, amid newspaper reports surrounding a 100,000 euros bridging loan he made to the FAI, it was announced he was to leave his existing role to take up the newly-created position of executive vice-president.